It wasn't something we hadn't heard before but after feeding off Graeme McDowell to win his place in The Open with a gutsy seventh place finish, Michael Hoey summed up the thrilling performance of the two-time Open de France winner. "It was great," Hoey said of his former Walker Cup foursomes partner. "He is just mentally very, very good. Very solid on the greens and hits the right shot at the times. Fortunately, I was able to do that as well down the stretch. He's a great competitor. A warrior, really." As for McDowell, he confessed that what was a sensational final round performance could not have come at a better time — especially with competition for Ryder Cup places looking more fierce than ever. It was also a vindication of his decision to play a light schedule that looked as if was about to backfire in terms of earning enough Ryder Cup points to take some of the heat of heading into the last two majors of the year. "I feel very fortunate," McDowell said after his 67 gave him his 10th European Tour win and his first successful title defence. "Kevin Stadler is a great, great player. I literally gave him that [two-foot par] putt on the last. I didn't expect him to miss that. It's not really the way you'd like to win. I was ready to go into a playoff. But I will take it and run. "I really, really needed this victory. It was a special one for me. It is pretty timely. There is a busy summer ahead and this is a really good kickstart to my summer. "I birdied 13 and got a really good break on 14 - got a little nudge off the fringe and managed to make the putt - and at that point I thought, 'Here we go.'" McDowell started the day eight strokes behind Kevin Stadler but found himself tied for the lead when he birdied the second and ninth in the worst of the weather and then rattled off three birdies in a clutch, four-hole run at the 13th, 14th and 16th to take a two stroke lead. A bogey at the last and Stadler's birdie two at the 16th set up a heart-stopping finish. But having done the hard part by hitting the 18th green in regulation, the American they call the Smallrus three-putted, missing a tiddler for par that would have forced a playoff. McDowell wasn't complaining and when asked about his decision to play a light schedule in recent weeks, he confessed that he was beginning to get worried that he had made a mistake as he slipped further away from the automatic Ryder Cup places. "It looks like a good decision now but I have to say myself and my team were starting to question the decision," said McDowell, who returns to the US now before returning next Sunday to prepare for The Open. "But my body has never been in as good as shape at this part of the season, coming into two major championships, the FedEx playoffs and obviously, hopefully, the Ryder Cup. 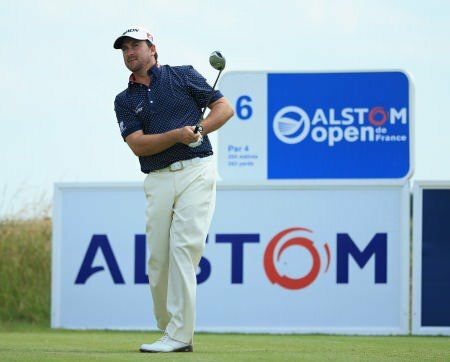 "So I am very proud to defend my first title ever and very proud to win the Alstom Open de France. This was the boost I needed on many, many fronts, especially the Ryder Cup." Hoey was rightly proud of the way he fought for his place at Hoylake, picking up crucial birdies at the 15th and 16th as he played the back nine in level par for a 71 that earned him seventh place, a cheque for €90,000, his fifth Top-10 of the season and a move to around 160th in the world. Graeme McDowell with the Claret Jug in Paris this week. An omen? He will be making his third Open Championship appearance at Royal Liverpool but his compatriot McDowell, who led after a first round 66 at Hoylake in 2006 only to fade to 61st, can't wait to get back there. "Very much so," McDowell said. "I was at Hoylake a couple of weeks ago. It was my type of British Open set up. You really have to find fairways off the tee. That is a staple of my game and it has big flat greens where you can hole some putts. "This is a nice confidence booster. I will get myself back to Florida, spend some time with my wife and family for a few days and I will be back at Hoylake next Sunday, ready to go."